Rick Ross showed up at Meek Mill rally in Philadelphia on Monday to show his support. The MMG boss has been weighing in on the controversial sentencing since last week and now he shared some more words with the fans in person at a massive rally in front of the Philadelphia’s Criminal Justice Center. 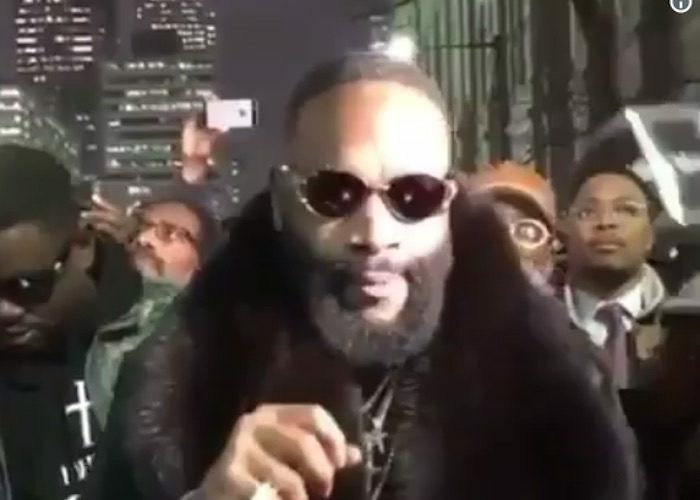 Thousands of fans converged in front of the building on Monday night with plaque cards shouting “free Meek Mill.” Rick Ross got on the microphone to share his feelings about Meek’s case and the overall state of the criminal justice system. Rick Ross had a massive crowd around him as he spoke in length about what has been a problem in America for decades with the mass incarceration of young black men. A couple other celebrities also showed up to the rally including some Philadelphia Eagles players like Wendell Smallwood, Torrey Smith, and Jalen Mills.